This is my working title for a book I plan to write in a new way (at least for me!). 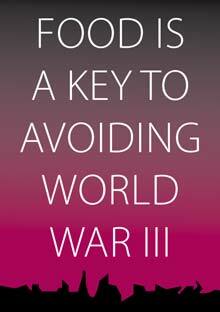 When I wrote The Food System with Tony Worsley in the early 1990s he was in Australia. We did not meet after spending a month together working on the synopsis in 1990. Thereafter, we swapped drafts over JANET – the joint academic network and precursor to the Web. With the more recent book, The Future Control of Food, we had several consultation meetings with a first draft that led to a restructuring of the book. I want this new book to be accessible and of interest to a wider audience than my earlier books. It will develop the theme I have been exploring in my recent lectures and workshops (click here for link). I want it to contribute to a process that shifts the agenda towards the kind of food systems discussed here. I aim to use the opportunities that now exist to produce materials in a new way different from the traditional way of producing books. My aim is to share knowledge through this website during writing process not simply producing a product. Part of the book will involve something akin to an action plan / manifesto into which I would need to draw ideas and experience of people from a wide range of institutions, and perspectives that pulls together this sufficiency perspective with a set of proposals for how to change. This would link into questions of who takes action, to what ends and aimed at what leverage points for change, as well as issues of power and control. So my idea is of a partly crowd sourced book involving those who are interested. I would share bits out as I develop it, and welcome feedback that I would use in revising the final product, developing it as I go along. I would not, however, be able to engage with that feedback directly all the time as it might prevent getting the full draft done. Those interested would have to sign up for it. I will also be looking at how to make this a shared process, in a creative commons way as well as produce a final product that might also be publishable in a more traditional manner – and generate some future income for me to help continue this work. My aim is to draw together threads from a wide range of work and things I have done in the past, using food as a lens through which to look at the challenges we face, and a way of illustrating the choices we face and highlight ways to make choices and adopt policies that make for a fairer, safer, healthier world. Please contact me if you would like to receive drafts of the book as it progresses. Please note, I will only respond to or take note of feedback from people using their own name and any relevant affiliation. I will look at how to deal with feedback - could be a comment section behind a password protected site, or via e-mail. Listen to Paul Rogers' opening remarks to the roundtable I convened at the Agriculture, Food and Human Values Society in 2011. Paul is professor of Peace Studies at the University of Bradford and provides a broad context within which looking at how today's food system faces huge challenges.